Be assured I did not think this pie making plan through in all it’s permutations. I did not look for reasons for this “idea” of mine to make sense. It is totally impractical and perhaps just a little bit crazy. Who in their right mind would undertake such a task? Maybe no one. But this idea woke me from a sound sleep one night and I had to believe that it was a good idea. Today I wanted to thank a woman who has been my veterinarian for many years. Dr. Ann Swartz is sort of a traveling vet. She holds office hours but also travels to homes to help folks take care of their pets. Ann has come to my home on more than one occasion to help us with our various pets: Grover (our pound puppy), Basil (our very old cat) and a bunny or two. She has always been gentle with our pets. I appreciate that she has always been forthright in her explanation of the problem and also in our treatment options. She has helped me through some very difficult times by showing us patience and understanding. 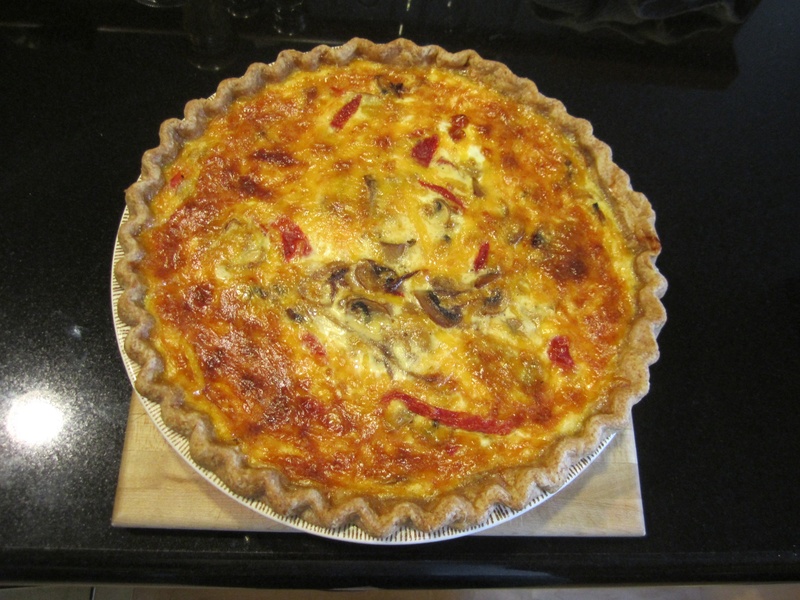 To thank her, I have made her a quiche – so that she would have a chance to take it easy tonight. We truly appreciate your dedication to our pets. I know that Ann will appreciate the quiche! I am constantly amazed at how many people know her. We met when our daughters became friends in kindergarten and have been friends ever since. She is a much-deserving recipient of your wonderfulness! That’s so cool that you got one, too! YUM! Yummy!!! I love checking back every day to see what pie you’ve concocted and whose day you’ve warmed!